As we developed this site, we realized that we don’t know much about Scotch Plains, NJ, other than about a mile and a half of NJ Route 22 cuts through it. We just haven’t spent any time there! And of course, we understand that it’s one of the suburbs that many people choose to live in due to its proximity to NYC and Newark. Help us explore. Anything worthwhile to visit? Scotch Plains is a township in Union County, New Jersey, United States. As of the 2010 Census, the township’s population was 23,510, reflecting an increase of 778 (+3.4%) from the 22,732 counted in the 2000 Census, which had in turn increased by 1,572 (+7.4%) from the 21,160 counted in the 1990 Census. The area known as Scotch Plains was first settled by Europeans, including many Scottish Quakers as early as 1684. The name is said to have come from George Scott, a leader of a group of Scottish settlers. It later served as a stop on the stagecoach line between New York and Philadelphia. The Ash Swamp in Scotch Plains was the scene of a key action in the Battle of Short Hills, on June 26, 1777, which included skirmishes as Washington’s forces moved along Rahway Road in Scotch Plains toward the Watchung Mountains. An ancient house in Scotch Plains recalls those skirmishes and, with the acreage adjoining the house, presents a vista of that decade, the 1770s. This was the home of Aunt Betty Frazee, whose retort to Lord Cornwallis led the British to find their bread from friendlier bakers in the same battle. The farmstead of Betty and Gershom Frazee is being restored by local organizations. Scotch Plains was home to the Shady Rest Country Club, the nation’s first African-American country club. Its pro, John Shippen, the first American golf professional, led the 1892 U.S. Open in the final round before finishing fifth. The Shady Rest clubhouse hosted Cab Calloway and other greats as a local center for African-American culture in the 1920s and 1930s. It is preserved today as the Scotch Hills Municipal course. A much more complete history of the township can be found in the October 28, 1999, “Our Towns: Scotch Plains-Fanwood (2nd Annual)” issue of the The Times of Scotch Plains-Fanwood, produced by the town’s newspaper of record at the time as well as on the township’s website. According to the United States Census Bureau, Scotch Plains township had a total area of 9.050 square miles (23.440 km), including 9.018 square miles (23.358 km) of land and 0.032 square miles (0.082 km) of water (0.35%). The township borders the municipalities of Berkeley Heights, Clark, Fanwood, Mountainside, Plainfield, and Westfield in Union County; Edison and South Plainfield in Middlesex County; Watchung in Somerset County. Unincorporated communities, localities and place names located partially or completely within the township include Alton, Goodmans, Graceland, Two Bridges and Willow Grove. Bloomberg Businessweek ranked Scotch Plains as the most affordable suburb in New Jersey in its 2009 report. At the 2010 United States Census, there were 23,510 people, 8,595 households, and 6,429 families residing in the township. The population density was 2,606.9 per square mile (1,006.5/km). There were 8,896 housing units at an average density of 986.4 per square mile (380.9/km). The racial makeup of the township was 77.43% (18,203) White, 11.08% (2,605) Black or African American, 0.12% (29) Native American, 7.65% (1,799) Asian, 0.01% (2) Pacific Islander, 1.39% (327) from other races, and 2.32% (545) from two or more races. Hispanics or Latinos of any race were 6.73% (1,582) of the population. There were 8,595 households, of which 37.4% had children under the age of 18 living with them, 62.6% were married couples living together, 9.2% had a female householder with no husband present, and 25.2% were non-families. 21.7% of all households were made up of individuals, and 10.0% had someone living alone who was 65 years of age or older. The average household size was 2.72 and the average family size was 3.20. In the township, 25.9% of the population were under the age of 18, 5.7% from 18 to 24, 24.9% from 25 to 44, 29.3% from 45 to 64, and 14.2% who were 65 years of age or older. The median age was 40.9 years. For every 100 females there were 91.5 males. For every 100 females age 18 and over, there were 88.3 males. The Census Bureau’s 2006-2010 American Community Survey showed that (in 2010 inflation-adjusted dollars) median household income was $104,873 (with a margin of error of +/- $6,397) and the median family income was $126,138 (+/- $7,410). Males had a median income of $90,016 (+/- $11,033) versus $66,022 (+/- $5,055) for females. The per capita income for the borough was $52,488 (+/- $3,094). About 1.3% of families and 3.0% of the population were below the poverty line, including 2.7% of those under age 18 and 4.7% of those age 65 or over. Shackamaxon Country Club is a private golf course, swimming and tennis facility also hosting celebrations, founded in 1916 and is located on Shackamaxon Drive in Scotch Plains. Some of its 130+ acres occupy land in Westfield. Scotch Hills Municipal Golf Course, known as the Shady Rest Golf and Country Club before it was taken over by the township, was at one time the only African-American country club in the United States. Bowcraft Amusement Park is an amusement park located on Route 22 West that was featured in scenes in the films Mortal Thoughts (1991) and North (1994). Highland Swimming Club is a private swimming facility with a large L-shaped main pool and a smaller kiddie pool, a BBQ area, a small “Snack Shack”, and play area named “The Grove”. Its swim team competes against other private swim clubs in the area in meets held mostly in July. It also hosts an annual swim meet with a club from Derry, Northern Ireland. As of May 2010, the township had a total of 89.39 miles (143.86 km) of roadways, of which 75.06 miles (120.80 km) were maintained by the municipality, 11.95 miles (19.23 km) by Union County and 2.38 miles (3.83 km) by the New Jersey Department of Transportation. 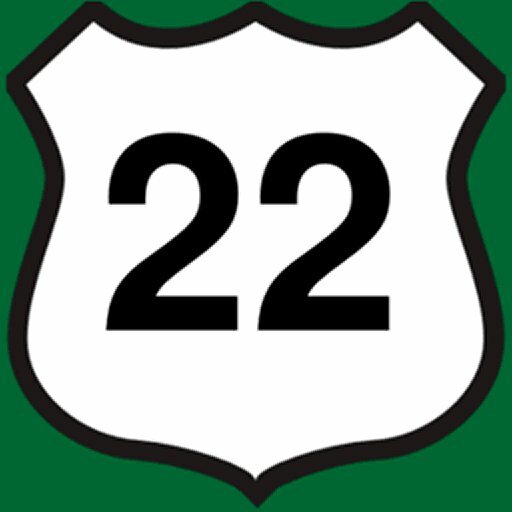 The two major roads that pass through are Route 28 for a brief stretch in the central part and U.S. Route 22 in the north. The township is accessible from limited access in neighboring communities, such as Interstate 78 in both Watchung and Berkeley Heights, the Garden State Parkway in Clark and Interstate 287 in Edison Township. Scotch Plains is bisected by New Jersey Transit‘s Raritan Valley Line, formerly the mainline of the Central Railroad of New Jersey. A passenger station is located in Fanwood. Another rail line, the Lehigh Line, carries freight trains through the southernmost tip of the township. New Jersey Transit offers service on the 112, 113, 114 and 117 routes to the Port Authority Bus Terminal in Midtown Manhattan, and service to Newark on the 59, 65 and 66 (Limited) routes. Newark Liberty International Airport is approximately 14 miles (23 km) east of Scotch Plains, most conveniently reached via Route 22, and Linden Airport, a general aviation facility is in nearby Linden, New Jersey. Newark Liberty International Airport is also accessible via New Jersey Transit train by transferring from the Raritan Valley Line to the Northeast Corridor Line at Newark Penn Station. New development located off Martine Avenue by Union Catholic. Erected in the early 1990s, it used to be a cow farm. It has its own tennis courts for residents. Located behind Coles School, it was built by the same development company that built Stirling Chase to be a more affordable place to live than Stirling. It has its own swimming pool and two tennis courts for residents. A small and quiet neighborhood located north of Route 22 completely isolated from the rest of Scotch Plains. Complex of townhouses between Scotch Plains and Clark. Robinson’s Creek runs through it and has been tested by the United States Environmental Protection Agency and confirmed to be toxic. Built in the 1940s, a development of several unique Cape-Cod style homes on the border of Westfield, many of which have been knocked down with newer and larger homes rebuilt. K. Hovnanian recently built townhomes ranging from 2,000–2,500 square feet in size, located behind US 22, originally selling for up to $500,000. The Aunt Betty Frazee House is a farmhouse of a colonial-era couple Gershom and Elizabeth Frazee, the latter of whom was approached by British generals in 1777 who sought to buy bread she’d been baking that day. Aunt Betty’s famous retort (“I offer this bread not in love but in fear” — whereupon the generals courteously abandoned their effort to buy) puts her in company with Betsy Ross, Molly Pitcher and other women who distinguished themselves in the American Revolution. Her house is on state and national historic registers, and many in the community are seeking a way of restoring the house (at 1451 Raritan Road) to honor Betty’s story and secure it in American history. Hillside Cemetery is the burial site of Dudley Moore and Senator James Edgar Martine. John’s Meat Market is the site of Mr. T‘s reality TV show for TV Land. Osborn-Cannonball House Museum is a historic home located at 1840 Front Street that is operated by The Historical Society of Scotch Plains and Fanwood New Jersey. John H. Stamler Police Academy trains officers and volunteers throughout Union County and is located on Raritan Road. The Jewish Federation of Central New Jersey has its Jewish Community Center and offices on Martine Avenue. Audrey Assad (born 1983), contemporary Christian music artist with Sparrow Records. Alan Augustine (d. 2001), politician who served as Mayor of Scotch Plains, councilman, freeholder and in the New Jersey General Assembly, representing the 22nd Legislative District. Thomas J. Barr (1812-1881), politician who represented New York’s 4th congressional district from 1859 to 1861. Hank Beenders (1916–2003), early professional basketball player. Carol Bellamy (born 1942), former Executive Director of UNICEF and director of the Peace Corps. David S. Blitzer (born 1970), part owner of the New Jersey Devils of the National Hockey League, Philadelphia 76ers of the National Basketball Association who is a senior executive at the private equity firm Blackstone Group. Judy Blume (born 1938), author, lived in Scotch Plains while writing the classic Fudge series of children’s books. Derrick Caracter (born 1988), power forward/center for the University of Texas-El Paso Miners team who was drafted by the Los Angeles Lakers in the 2010 NBA Draft. Abraham Coles (1813-1891), physician, translator, author and poet. Ezra Darby (1768-1808), politician who represented New Jersey’s at-large congressional district from 1805 until his death. Donald DiFrancesco (born 1944), former Governor of New Jersey and Senate President. Pat DiNizio (born 1955), singer/songwriter for The Smithereens. Jerome Epstein (born 1937), politician who served in the New Jersey Senate and then went to federal prison for being a pirate. John Gano (1727–1804), chaplain who baptized George Washington. Ashton Gibbs (born 1990), starting point-guard for the Pittsburgh Panthers men’s basketball team. Scott Goldblatt (born 1979), swimmer who won a Gold medal at the 2004 Summer Olympics in Athens and a Silver medal at the 2000 Summer Olympics in Sydney, Australia, with both medals earned in the 4 x 200 m Freestyle Relay. Jeffrey Hammonds (born 1971), former MLB outfielder who had one all-star appearance in his 13 seasons. Jerome Hines (1921–2003), opera singer. Tom Jackson (born 1948), former football player and coach who was head football coach at the University of Connecticut from 1983 to 1993. Nathan Jones (born 1982), cornerback for the Denver Broncos. Hillary Klimowicz (born 1987), basketball player who has played for Limoges ABC. Mary LeSawyer (1917-2004), opera singer. Joseph Malchow (born 1985), technology executive and venture capital investor. Bryan Meredith (born 1989), goalkeeper who has played for the Seattle Sounders FC of the MLS. Renaldo Nehemiah (born 1959), track star who set world record in the 110 meter hurdles, NFL wide receiver for the San Francisco 49ers and the only four time winner of ABC’s Superstar competition. Thomas W. Osborn (1833–1898), Union Army officer who represented Florida in the United States Senate. Joe J. Plumeri (born 1944), Chairman & CEO of Willis Group and owner of the Trenton Thunder. John F. Rague (1799-1877) architect who designed and built the 1837 Old Capitol of Illinois and the 1840 Territorial Capitol of Iowa. Cynthia Sayer (born 1956), jazz banjoist. Joe Scarpati (born 1943), holder for Tom Dempsey‘s record 63-yard (58 m) field goal in 1970. Marc Shaiman (born 1959), composer and arranger who has worked on the musical Hairspray and the film South Park: Bigger, Longer & Uncut. Enzo Stuarti (1919–2005), tenor, musical theater performer. Samuel Swan (1771-1844), physician and politician who represented New Jersey’s at-large congressional district from 1821 to 1831. Lance Thomas (born 1988), power forward / center for the Oklahoma City Thunder. Frank Thorne (born 1930), comic book artist and writer best known for popularizing the Marvel Comics character Red Sonja. Troi Torain, radio host and “Star” of Star and Bucwild. David S. Ware (born 1949), jazz musician. Melissa Murphy Weber (born 1969), attorney and politician who served in the Pennsylvania House of Representatives from 2003 to 2004.